Dio can ingest files from your pro memory cards up to four times as fast as other card readers. What's its secret? 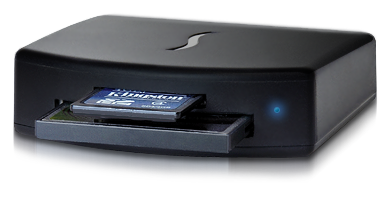 This Sonnet reader exploits its 5.0 Gb/s SuperSpeed USB 3.0 interface to deliver superior performance with suitably equipped computers. Dio is UDMA6-enabled and UHS-I-compliant for CF and SD media, respectively. 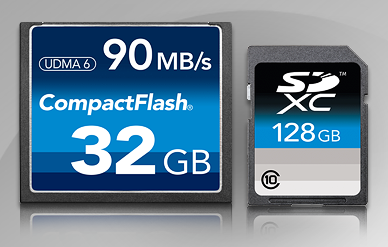 As a result, Sonnet’s high-performance memory card reader transfers data from currently available CF cards at up to 70 MB/s, while it supports at full speed the fastest available SDXC and SDHC memory cards, as well as future cards up to 104 MB/s. This little, rugged Sonnet pro media reader is compatible with Windows® desktop and laptop computers with USB 3.0 ports. Got a Mac®? It is also compatible with Mac® Pro computers with Sonnet’s Mac OS® X-compatible Allegro USB 3.0 PCIe adapter card installed, and MacBook Pro computers using Sonnet's Mac OS X-compatible USB 3.0 ExpressCard/34 adapter. No USB 3.0 ports at your disposal? Dio is backward compatible with USB 2.0 connections, too. Download Files in a Flash. With a compact and durable design, Sonnet's Dio provides lightning-fast access to your files stored on CompactFlash and SD media cards via a USB 3.0 interface. No USB 3.0 port? No problem. Dio is completely USB 2.0 backward compatible.